Rose, the sea lion who found her way onto the streets of Point Loma, is back in the ocean after two weeks of care at SeaWorld San Diego‘s animal rescue center. 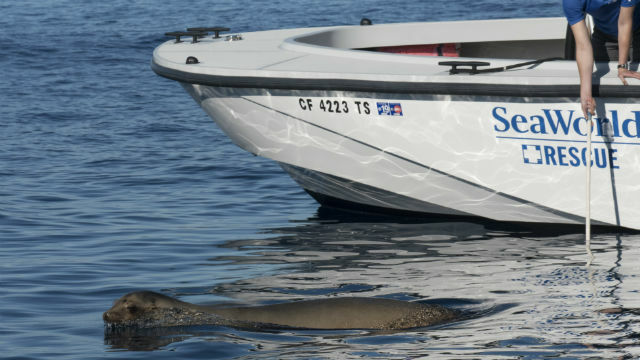 The wayward sea lion, whose appearance made national news, was returned to the ocean Friday along with three other rescued sea lions several miles off the coast of San Diego. SeaWorld received calls on Oct. 22 about a “sea lion in the street” in the Point Loma area. Once on site, the park’s rescue team found an adult female sea lion lying in the middle of Garrison Street near Rosecrans Street. The 175-pound animal was in good condition when rescued and responded well to treatment at the park. SeaWorld officials said that while it was somewhat unusual to find Rose several blocks from the water on a public street, SeaWorld has rescued sea lions from homes, parking lots, hotels and restaurants. So far this year, SeaWorld’s rescue team has come to the aid of more than 900 ill, injured and stranded marine animals, including sea lions, seals, sea turtles and birds.